The week of February 12, 2018, the Campaign for Public Education (CPE) launched its pre-election Fix Our Schools campaign push with a training workshop for 60 teacher-activists and by sending campaign materials to the school councils at the 200 schools in Ontario most in need of repair. The materials highlight how chronic underfunding of Ontario’s schools has led to a $15.9 billion repair backlog and include a campaign pledge for councils to bring to the attention of their local MPP, asking them to commit to safe, healthy, and well-maintained schools. 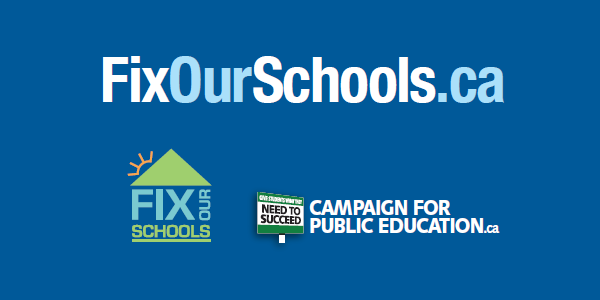 Use the Fix Our Schools website to send your own message to Premier Kathleen Wynne, Education Minister Indira Naidoo-Harris, and your MPP. Repairs are only going to get more expensive and school conditions are only going to worsen. The time to fix Ontario’s schools is now.